Its meaning is apparent: Superhero fiction operates best when it leans into its inherent absurdity. That doesn’t mean such stories cannot be ‘serious’ or contain deeper reflections. Grant Morrison’s applauded miniseries All-Star Superman, for example, presents some of the more fantastical elements of the genre – super-serums, 50s-inspired monster fights; sublime science-fantasy – while simultaneously acting as a reflection on legacy and mortality. However, from the late-1980s to the present, we have seen a slew of dreary superhero fables, to varying degrees of success. In order to distinguish itself from the competition (the hugely successful Marvel Cinematic Universe), the recent cinematic output from DC/Warner Brothers has attempted to emulate the darker aesthetics of books like The Dark Knight Returns, without the thematic gravitas or understanding that such stories were intended to be deconstructionist takes on well-established characters. Man of Steel and Batman v Superman: Dawn of Justice were universally panned for being bombastic, heartless, confusing adaptations of the source materials upon which they are based. Consequently, in the case of BvS, negative critical reception led to a historic box office drop of 81.2% in its second weekend. In a bid to not lose money (a genius corporate strategy), Warner Brothers quickly overhauled the entire creative vision for the DC Movie Universe. Shazam! is the culmination of these efforts. The film strips back the appeal of superhero adventures to its essentials – childhood wish fulfilment – and gives it a glossy millennial sheen. Shazam! centres around 14-year-old Billy Batson (Asher Angel) as he bounces from foster home to foster home while searching for his biological mother. He is granted magic powers by an ancient wizard known as Shazam (Djimon Hounsou), transforming him from a child into a (seemingly) grown-up, Superman-esque figure when he says the wizard’s name out loud. He shares his secret with his newfound foster brother, the paraplegic, superhero-obsessed Freddy Freeman (Jack Dylan Grazer). Shazam! is at its best when it joyfully explores what it would be like to see two kid brothers play around with superpowers: Freddy films Batson, in full Shazam mode, testing out his flight and lightning abilities, and he becomes a viral sensation. The two prevent a burglary in a petrol station (the boys having been in the store attempting to buy beer) and are boyishly delighted to find that Batson’s alter-ego is bulletproof. They pitch ridiculous superhero names to each other (“Captain Sparkle Fingers”) and attempt to get into a gentlemen’s club (but only to grab some chicken wings). Basically, they have fun. Every superhero origin story has an extended scene where the hero plays around with their powers for the first time. But nowhere before have we seen this concept approached with such abandon, and for such a huge portion of the film. The audience is invited by director David F. Sandberg (Lights Out) to share in the children’s joy, and for the most part he is successful. This is down to the performances of Angel, Grazer and Zachary Levi. The latter, in particular, is perfectly-cast as Batson’s Shazam persona. He balances childlike wonder with traditional super-heroics, gracefully carrying both the comedic and more serious scenes he is featured in. This world is inhabited by a Batman who murders people, and a Superman who levelled his home city without care. If these heroes are supposed to be represent the best of humanity, then it’s unsurprising that everyone’s moral compass is skewed. It’s also a slick reference to our obsession with angst-laden anti-heroes. We never get the sense that Batson was right in saying he was undeserving of the title: There are no murderous rampages or long-winded monologues on the nature of heroism. He’s just here and he tries to do good. He’s a hero in the most basic sense, and this is honestly a breath of fresh air in a cinematic climate over-saturated with broody men in expensive costumes. The film falters slightly due to its run-time. Clocking in at 132 minutes, you do feel it overstays its welcome. The second act’s playful superpower montage could be shorter, and the climactic final showdown could also have done with some editing down. Although, every scene with Mark Strong’s gruesomely over-the-top-to-the-point-of-camp villain, Dr. Thaddeus Sivana, is an absolute joy to watch. There is no world-ending event here, either. The final fight of good-versus-evil is a personal one, and it contains a sweet twist with enough heart to warm over the most cynical of viewers. 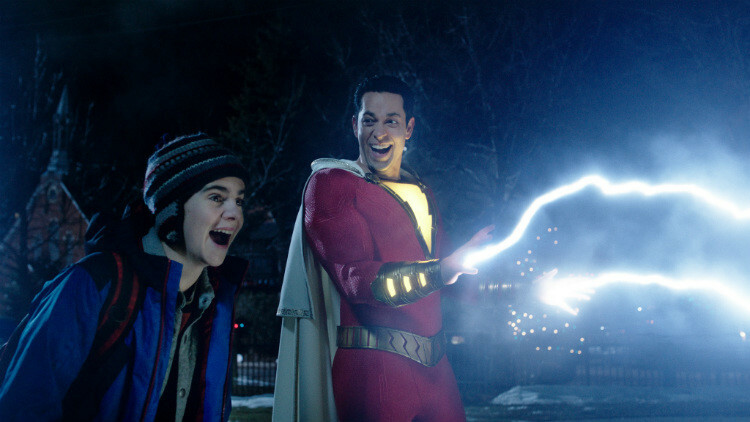 By daring to be silly, and by presenting a morally unambiguous hero, Shazam! is a welcome change of pace for DC’s fledgling cinematic output. One can only hope that they inject future installments in this franchise with enough optimism to keep people like me interested. Shazam! is out in cinemas now. David Monaghan is the former co-editor of HeadStuff's Film and TV section. He is also the former co-editor of OTwo, the University Observer's arts and culture supplement. 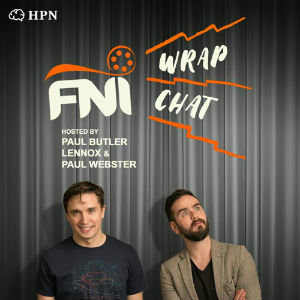 He is a Dublin-based writer, journalist and critic, and a two-time arts graduate, having completed a BA International in English with Film, and an MA in Film Studies. In his spare time he likes to read comic books and cry over Perfume Genius records.